18Aug2016 Update: Before investing in real estate, please read this first: Invest in Property PROPERLY. As promised, here are the steps in a TCT transfer and annotation. To get this far in your search, I assume you are now familiar with which home loan provider to get, what the steps are in a home loan, as well as the basic definitions of TCT, title transfer and annotation. Tax Clearances: this is different from the TD, a tax clearance basically says that Real Property Tax (RPT) payments on the property (detailed in the TD) are up to date. So it goes without saying that real estate taxes (amilyar) must be paid first before the property is transferred, and before the government releases any taxation document on the property. Documentary Stamp Taxes (DST): depends on the agreement of buyer and seller, sometimes seller shoulders this aside from EWT, sometimes this is split between buyer and seller, sometimes this is fully shouldered by buyer. The set-up is usually documented in the DOAS. This costs 1.5% of property selling price (e.g. Php1M property will have Php15k DST) or it can be higher when the appraised value of the property as deemed by BIR is higher than selling price (which rarely happens). Expanded Withholding Tax (EWT): this is to be shouldered by the seller / developer as taxes from the sales. Just present the EWT certification you got from the developer. Other Taxes and Fees: Be prepared to pay some more amount on other taxes and fees such as application fees, stamps fees, certification and documentation fees, etc. Oh by the way, allot some money for photocopying too! Once you’ve paid and while you’re still in BIR, submit the documents and all payments to apply for CAR. Basically, the CAR says that BIR is fine with the tax payments, and that buyer/seller may now formally register the sale with the Registry of Deeds. Up until this point, the agreement was just between buyer and seller. Once the CAR is available, even the BIR is amenable with the sale and registration of it in RD. CAR application and release usually lasts for two weeks. Once these are submitted, RD reviews them and then they show you the draft of the new TCT (the transferred title that cancels the old one). Once you confirm the details to be encoded therein, you will pay the TCT transfer costs (mine was Php8,700) as well as some fees and stamp charges again. Depending on the RD, title transfers usually last for another two weeks to a month. Copy of Tax Clearance and Real Property Taxes (RPT) Receipt: again, tax payments must be updated! You will be asked to pay the TCT Transfer Tax (again?!? Yes, this time in Municipal / City Hall level) (mine was Php6,400) and wait for 1-3 days before you get the TDs under your name. Moving forward, in the years to come, it should be your name that you see in the RPT. Usually, the bank handles this portion as they need to enforce their claim on your TCT. You just need to make sure that the TCT is finally under your name, as well as the tax documentations. Otherwise, how will the bank document its claim in a TCT that is not yours, or a property with delinquent tax payments right? Depending on the RD, annotations last for a month or so. There you go. I hope details provided here were able to give you some guidance on the TCT Transfer and Annotation process. Just note that this entails some going back and forth to a number of government offices, so lots of free time or vacation leaves will be needed if you are to do this task yourself. As mentioned above, developers or agencies usually offer this service, of course for a fee on top of all the things you need to pay for, as detailed above. Found this article helpful? Share to a friend who might be in need of this information too. Like us on Facebook, Instagram and Twitter. Subscribe to us via email to be updated on the latest personal finance articles we publish. Checkout my membership in Truly Rich Club and see if you want to enjoy the many benefits I get. Previous: Previous post: Is Christmas Just for Kids? Yes po. Ibang step pa kasi ang annotation. The transfer just means the property is named after you. Annotation will indicate that lender (in your case Pag-ibig) has a claim on the property because you have a loan from them. Once annotation is done, the claim of lender is legalized, that’s the time they have the comfort to release the proceeds. It pays to ready up all the needed documents for your title transfer as this is long process and the wait is long too. Be sure to have the patience and budget in transacting the transfer. Can we annotate a conditional deed of sale on the title? Hmm not sure po. RD will have the final say on this. But given the lengthy process involved in annotation baka they don’t allow this if conditional pa lang or sort of hindi pa final and binding yung sale. Meron pong fee depende sa value nung property. But usually smaller than the transfer costs and taxes na. Sa RD po nyo itanong para maestimate nila. https://polldaddy.com/js/rating/rating.jswhat if i have a deed of donation to my late uncle then i don’t have money yet to transfer but i want it to be annotated by the RD (register of deeds) is it possible? if yes how and how much will i spend? https://polldaddy.com/js/rating/rating.jsHi, may I know exacyly what are the steps in annotating a title? Hoping for your response with regards to this ,matter. Hi Marissa, just a disclaimer. I am no expert, I’m not even a licensed real estate broker. Just sharing my limited experiences. From your notes, it seems that the unfinished house construction was financed via a bank loan which has already closed? Nonetheless, you need to check whether the loan still has obligations which you might need to shoulder in case you are the new owner of the property. Unpaid taxes will definitely have to be paid, either by the previous owner, or oftentimes shouldered by the new owner. You may inquire about the outstanding taxes with the city / municipality where the property is located. in the TCT, who is named owner of the property? The seller? Then the bank has annotation which says they have a claim on the property? Usually the tax declaration is the last to be transferred to the new owner, what’s more important is who’s named as the owner in the title. Hi Juliet. First step is to do ocular of the property and see if you like it. Then ask for a xerox copy of his tct and check of there are any annotations therein. Then check the duplicate copy of that tct in the registry of deeds to make sure there are no annotations / emcumbrances related to a loan. You might also ask for copies of the real estate property taxes receipts to ensure that property taxes are updated. If everything is ok you may proceed with the sale. The capital gains tax is usually 6% of selling price shouldered by the seller but sometimes this is included in the deed of sale for payment of buyer. So it really depends. Othe charges will be transfer taxes, doc stamp taxes, cert of authorized registration etc. No hard and fast rules on who will pay these but most of the time the buyer shoulders these. The charges depend on the property selling price so pls check BIR, ROD and the municipalities / city hall for the charges. Kindly go through our article “How to invest in property PROPERLY” to know more details. Sir if i may ask, how much it would cost to annotate land title? Lets say PNB housing loan? Annotation cost depends on the property value, plus the varying service charges. Best to inquire with your loan / service provider. Maari nga pong ganun ang nangyari, na pinerahan lang kayo. Gusto nyo po ba ibenta yung property ninyo kaya nadala kayo sa sales talk nung ahente? The only way to check po is go to Registry of Deeds and check nyo yung duplicate na copy ng TCT nyo. Dapat parehong kopya ang may annotation – yung owners copy and yung duplicate na copy sa Registry of Deeds. Usually after annotation, hawak ng bank or financing company yung owners copy ng TCT. Kung hawak nyo pa yung TCT may chance na hindi pa na-annotate yung coy ng ROD but go there to be sure. ROD will rely on the signed documents lang kasi to annotate, they will no longer check kung nagkabayaran na yung involved parties kasi obligation na yun ng buyer and seller. The seller should not release the TCT without guarantee of payment. https://polldaddy.com/js/rating/rating.jsafter getting hold of the title finally, is it really necessary to provide the final copies of documents to the municipality? what if I did not provide the copies? Hi arlan, the municipality will use the docs to update the tax declaration documents and the name that will appear in the real estate property tax receipts. Personally, and if you’re OC, i think this should solidify your hold on the property because all docs attached to it are named after you. Hi Sir, I hope you could enlighten me. I got approved for Pag-ibig Housing Loan and I received my NOA last June. I am currently processing the necessary documents. I received my TCT and I do not know who could help me with the annotation in favor of Pag-ibig which is a requirement. Should I go to RD again or should I go to Pag-ibig? Thank you. Hi Junnel, RD will be the one to do the annotation in favor of Pag Ibig. Just make sure the requirements for annotation are already complete. You may find another article here in our site further detailing the requirements. May you have a richer life. https://polldaddy.com/js/rating/rating.jsWhat are the documents required for annotation? How will it cost again? I just paid capital gain tax, doc stamps, transfer tax, registration fee, etc.. I even paid a seperate doc stamps for the loan and mortgage agreement and promissory note.. I received the TCT owner’s duplicate copy and I returned it again to RD for annotation..
Good day Sir/Mam.. Me and my husband bought a house and lot located in a subdivision last April 2013. The seller of the property and I together with my father personally appear at the law office where we signed couple versions of deed of absolute sale. Since we still didn't have the enough money then to process the transfer of title , we are worried that we may end up paying penalties if we will finalized the date of sale and so we agreed that we will just come back once ready and so we are given the copies of the 2 version of DAS. My question is, would there be a problem now if i want to pursue the transfer of title, valid pa din po ba yung napirmahan namin dati sa office ng atty or pwde namn po magpagawa ulit ng deed of sale para po d po kmi magbayad ng penalty? gsto ko na po kasi ipalipat pati name sa mga bills and also for legal purposes also. slamat po s response in advance. Hi Debbie, sorry for the late response. Usually for cases you mentioned, there is no date indicated in the DOAS because that date will be the basis of BIR for assessing the applicable taxes (and penalties, if any). So if there’s no date, then might be okay to put the more recent date. If there is a date already, approach the law office if they can nullify the previous DOAS (assuming it wasn’t notarized yet), then both parties can just agree on executing a new DOAS. Note though we’re not lawyers here so this is just our limited take on the matter. If i recall correctly, the usual documents needed in the title transfer (Deed of Sale, Reasl Estate property taxes, documents from assessors office) plus the documents showing pag ibig has a claim on the property (loan documents etc). The cost will be a function of the transaction amount in this case the loan amount plus some admin fees. Yes processing the home loan can be costly with all the taxes and fees especially if you’re the one doing the processing. For bank financing, they are the ones who usually do this but for a higher interest of course. https://polldaddy.com/js/rating/rating.jsHow long do you think it will take to get back my TCT owner’s duplicate copy? And what is TCT RD’s copy? I am the only one who is processing everything, and it’s really hard.. Yes it can really be hard. Just keep in mind that eventually you’ll have a place to call your own. During my time title transfer took 2 to 3 months then the annotation another month but that was 10 yrs ago. It also depends on the RD if they’re handling too many transactions. Every property has two TCTs, the owners copy and the RD duplicate copy. Any transfer or annotation done in the owner’s copy will also be done in the duplicate copy. This is to safeguard againts bogus transactions and fake titles. https://polldaddy.com/js/rating/rating.jsIs that mean sir I have to secure an RD’s copy too with annotation? Because Pag-ibig requires me to submit TCT owner’s copy and TCT RD’s copy, right? And both should be annotated? Thank you so much for taking time to answer my questions. I really appreciate it kc nangangapa talaga ako..
Hi Junnel. RD will probably give you a certified true copy of the duplicate they have but they will never release to you the actual TCT because it’s meant to stay there for security purposes. It’s actually what triggered me to write these posts because 10 yrs ago, nangangapa rin ako every step of they way. Goodluck po and God bless. Hope to hear from you again pag ok na TCT and loan mo. Also looking forward to your comments in our other articles. Maybe this time in loans? Lastly, if you’d be kind enough to leave a review and rating (stars) of us and our site via our Facebook page, it will mean a lot in this personal advocacy and hopefully we reach more people. Thanks! Pag-ibig po is the best office to ask since they will be charging the fees. Iba iba po kasi yan per provider. Best to check with ROD what their rules are. From what we know, may expiry yung documents (from date of transaction) for BIR tax purposes pero hindi na kayo dadaan ng BIR for this process then ROD na lang kausap nyo. May documentation po ba kayo nung sangla? 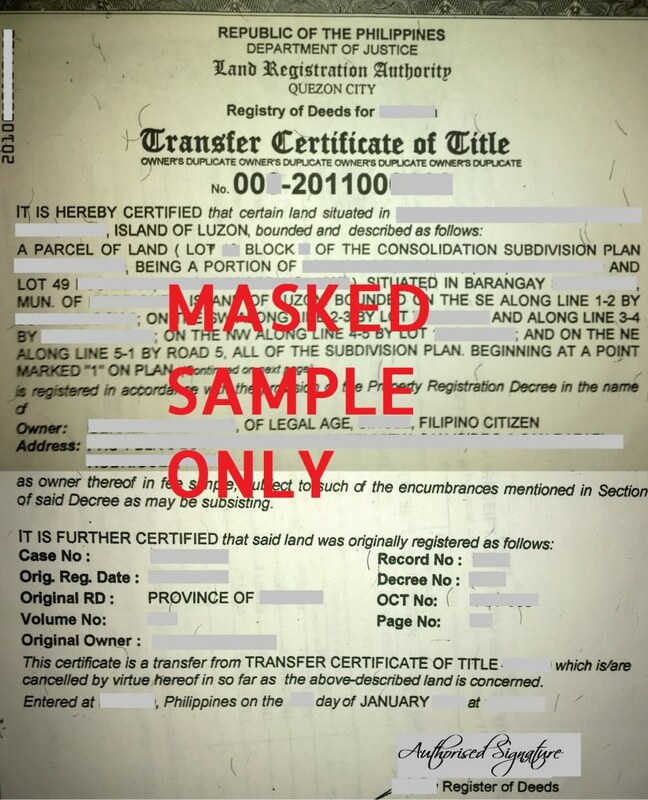 The owner cannot sell the property without the original title na hawak ninyo. So don't let go of that, pero best if you have a documentation ng sangla. Check our Aug 18 2016 article. One should always invest in property PROPERLY. Wag po basta pasok ng pasok sa sangla or any financial transaction without documentations.